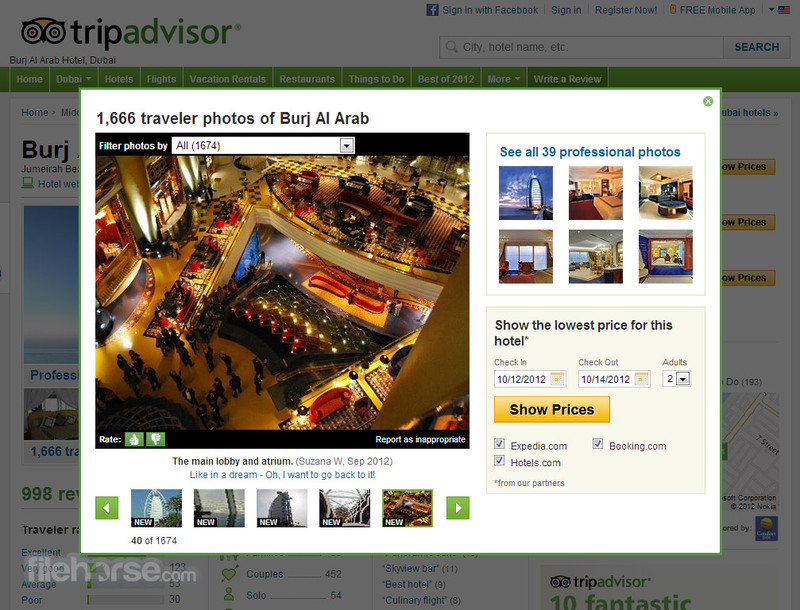 TripAdvisor is perfect online destination for planning and searching information for your perfect holyday. With one of the largest databases in the world, TripAdvisor will be able to fulfill your every need, no matter how far you are willing to travel. From the moment you arrive to TripAdvisor you will witness that everything it offer can be accessed via intuitive user interface that will enable you not only to perfectly plan your holyday from dreams, but also to discover new destinations that are praised by many. You can even use “Near Me Now” feature which will find what famous travel destination are currently near you. With over 40 million reviews and ability to rate your own travel destinations, TripAdvisor definitely represent one of the best places to get informed. Reviews of Hotels and Flights! Your one destination for discovering unbiased travel reviews! Advances in internet technology and shifts in the way people use it have enabled many older websites to dramatically increase their popularity, reach and the amount of unique features they can deliver to each of their users. One of most popular sites that went through this kind of rise was none other than TripAdvisor, website aimed to give everyone up-to-date information about travel information, travel related-content, reviews, opinions, and interactive interaction between users. How did they manage that? Simply, they were one of the first websites which enabled its users to create their own “user generated content” in 2000, much before this concept became popular in modern internet landscape (2005-2006). 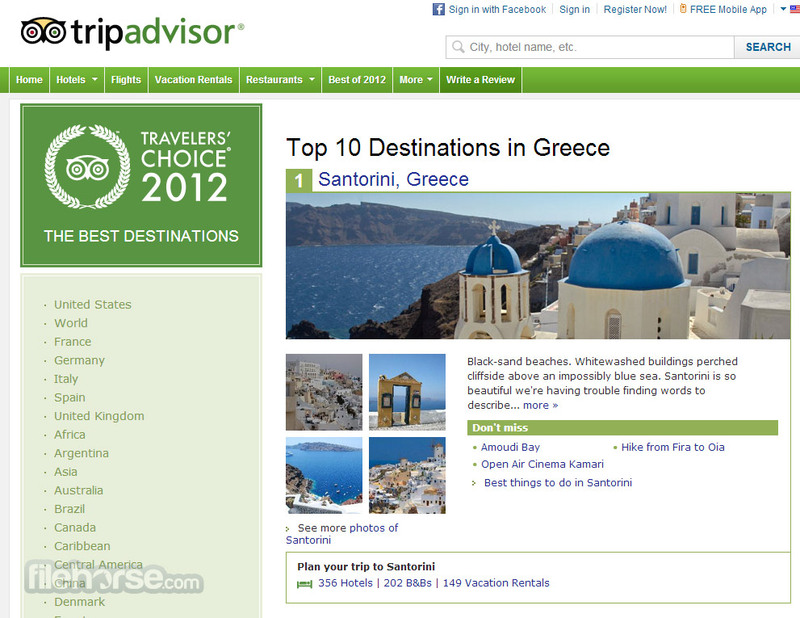 More than 10 years of content collection from millions upon millions of users, TripAdvisor managed to became the largest player in the area of internet travel information and landing in the top 200 list of most visited sites of all time. TripAdvisor offers to everyone streamlined, detailed and fast access to incredible wealth of information regarding travel plans, destinations, business, events, experiences and other travel-related content. Directly from the homepage you can start searching for the data that will help you have more enjoyable, productive and exciting trip, starting from finding hotels, flights, restaurants, rental prices, and more. Search function is also closely connected to the travel guides of the cities you are researching, and because of that you can instantly get notified of the interesting events that will happen around you if you really go to that destination for either business or pleasure. Planning of the vacation trip is also fully augmented with full pricing data for all expenses you may encounter, starting from travel costs, amenities, hotel prices, special offers and more. However, hard data about travel destination is often not good enough to give you true sense of how much fun you will have there. That’s why, perhaps the most important part of TripAdvisor experience is the wealth of content that was provided by users themselves, most notably reviews and impressions of their trips. All of that data is easily accessible to you, and will most surely help you to make your travels plan more concrete. Reviews of Hotels and Flights! Interface of TripAdvisor is simple and modern, allowing users to easily find content, collect that data and make decisions about their trips. 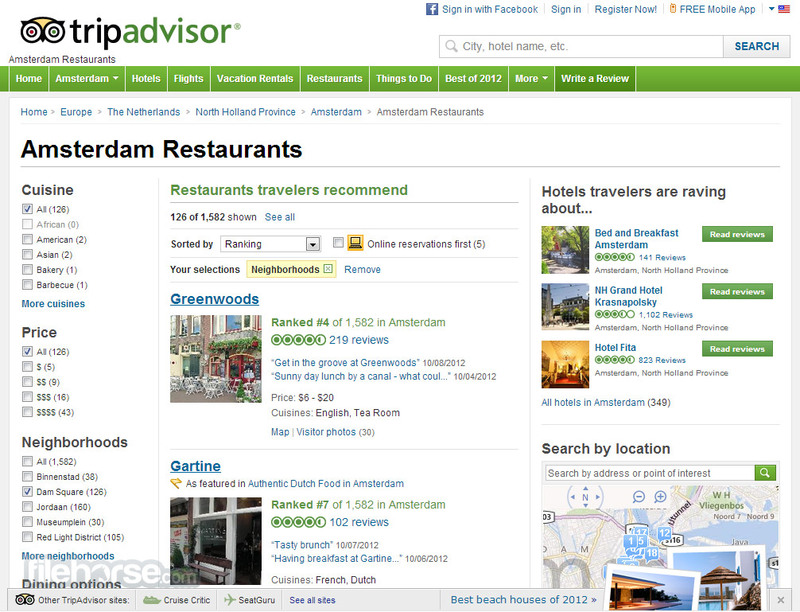 The basic green and white design is filled with lots of pictures of places people visited, and pages for each travel establishment are presented with clear view of user reviews and opinions, ratings, maps, nearby travel destinations and establishments, reviews separated for specific travel categories (families, couples, solo, business) and detailed ratting summary of all most important segments of the reviews (sleep quality, location, rooms, service, value, cleanliness) and more. Creating a new account on TripAdvisor can be done in three different ways – by providing your Facebook credentials, logging in using your Samsung account, or manually providing your e-mail address, name and city you are currently residing in. Reviews of Hotels and Flights! 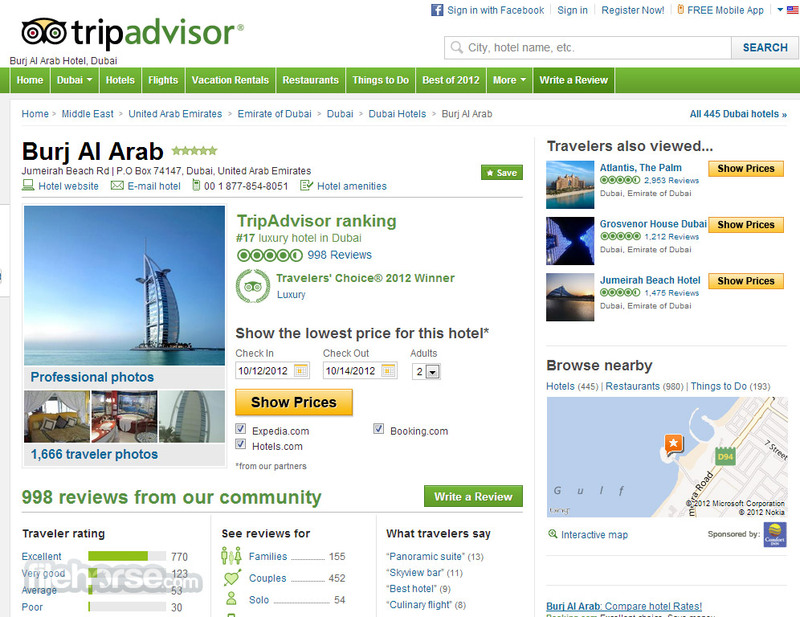 As for cost, TripAdvisor is 100% free and does not require money for any other additional feature of the site. Site offers purchasing options for trips themselves (including best deals), and features slight advertisement that is not intrusive. 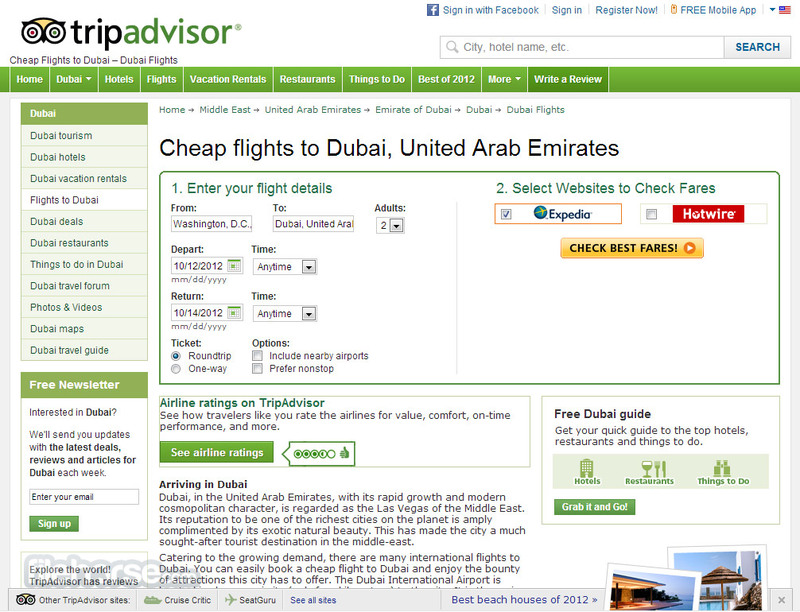 Planning for trip is never easy, but with TripAdvisor that process can become fast and effortless. Create account and start investigating logistics of reaching countless incredible locations that you have always wanted to visit.